Theresa May has written to the European Union (EU) to request a further delay to Brexit until 30 June. Reality Checks examines some of the key passages of the letter addressed to European Council President Donald Tusk. 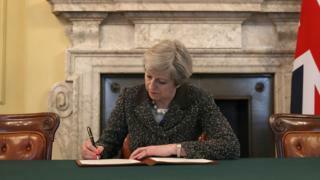 It is only towards the end of the letter that Mrs May spells out the proposed date for the further extension - 30 June. This is the same as the prime minister's original request, which just so happens to be two days before the new European Parliament meets for the first time.But such a relatively short extension may not be on offer - the talk in other EU capitals has been of a longer extension until the end of this year at the earliest. Mr Tusk is likely to suggest a one-year extension.The EU may well be more receptive, though, to the idea of a get-out clause: it would mean that if a deal were to be approved by MPs and ratified earlier, the UK could leave the EU straightaway. That would suit both sides, and it's another idea that Donald Tusk has been promoting behind the scenes. The PM still hopes a deal can be finalised before voting in the European elections begin on 23 May, but given the divisions in Westminster the timetable for that already looks really tight. She is referring here to discussions between the government and Labour - and MPs more broadly - aimed at agreeing a Brexit plan which can be put to a currently deadlocked Parliament. This section is also a reminder for rebellious Conservative backbenchers and the DUP and its leader Arlene Foster: under this prime minister you can forget about reopening the withdrawal agreement and changing the wording of the Irish backstop. The EU has been ruling that out for months. Theresa May tried and failed to get them to change their minds (although her Tory critics say she didn't try hard enough), and now she's emphasised again that the focus for any new suggestions has to be the non-binding political declaration on what the future holds. The votes on various options in the House of Commons are designed to do that - but there's no cast-iron guarantee that a future government wouldn't opt for a change of course. The prime minister really doesn't want to hold European elections, but here in black and white is a commitment to the EU that preparations for the elections are taking place. That includes making the legal order that sets the date of the poll on 23 May - something that needs to be done by 11 April. The government will hope that this provides reassurance to other EU countries that it will hold the elections if it has to. Downing Street will also hope that election preparations concentrate minds among MPs who are refusing to back the prime minister's deal. Brexit: What are the main sticking points? The language here is really important. The prime minister is saying that the UK will not try to block EU business or be obstructive to other countries - something backbench critics, such as Jacob Rees-Mogg, have already suggested could happen. The phrase "duty of sincere co-operation" carries some weight in Brussels, and is designed to reassure the EU that the UK will play by the rules as long as it remains a member state.